Are you considering Laser Assisted New Attachment Procedure™ (LANAP™)? Below are some common questions we receive about the procedure. With these technological advances, we are able to offer a "NO cut. No sew. No Fear." alternative to traditional gum surgery. Please give us a call if you would like more information about the laser procedure. The LANAP protocol is a patient friendly, minimally invasive treatment for gum disease. 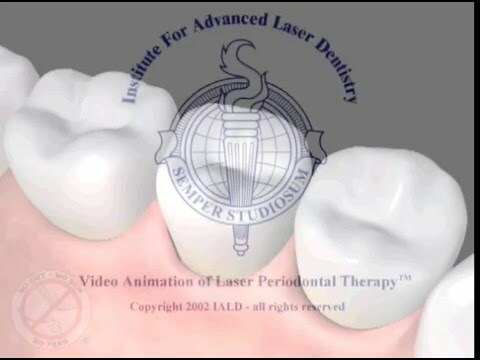 Using the PerioLase, dentists must be trained to perform this FDA cleared laser gum disease treatment. 1. Q: But my doctor said he'd have to pull my teeth because they are so loose, and I don't want to do that. A: We have been able to save a lot of teeth that other dentists wanted to extract. We have had great success in saving teeth that were to be extracted. There is nothing better than your own natural teeth. We can schedule a complimentary consultation for you! A: The laser is comparable to the fee for conventional periodontal surgery. It is not more because it is new technology. Our fee has actually been less than some of the offices using the conventional technique. 3. Q: How will I feel after the laser surgery? A: You may experience some ache, throbbing, or soreness. The doctor will then prescribe some antibiotics and an anti-inflammatory to take care of any discomfort you may experience. 4. Q: How many appointments will I need? A: Usually two treatment visits and a couple of post-operative visits. The doctor will then prescribe visits with a hygienist every three months to keep up what s/he has started. 5. Q: I only need a cleaning. That is all I have ever needed and had. Can the laser do cleanings? A: Yes, we do laser cleanings in the office. Our hygienists has been using the laser for almost 4 years now. 6. Q: Will my insurance cover this? A: We do not use any special codes because it is a laser. We u se the same codes that every office uses so coverage will not differ. 7. Q: Do you offer financing? A: We offer Care Credit Financing. It is a credit card for medical as well as dental services. It is easy to qualify for, and if you would like, we can send you an application. 8. Q: How do I know this will work? I had surgery 5 years ago, and I now need it again." A: The doctor can answer all of your questions regarding treatment. We offer a complimentary consultation so you can have all your questions answered. You can meet the doctor and staff and have a demonstration of the laser performed for you.